Next post: What’s that like? Here’s a look deep down in my psyche. Something I don’t like to talk about, but fine, let’s go there. My default belief is that success is for other people. No matter how hard I work, no matter what I put out there, I’ll never get to the top because someone else is already there. I feel like I need to accept the good-enough option because I’m never going to get the best of the best. And sometimes I fear I subconsciously sabotage my own efforts to achieve what I want because middle of the pack is comfortable. 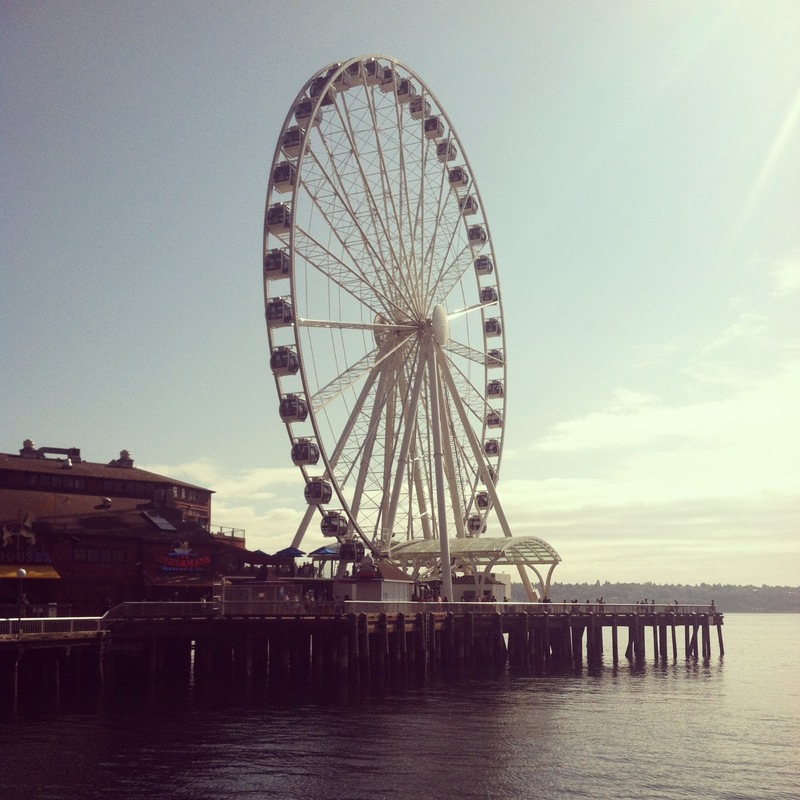 I made it to the top … of Seattle’s Great Wheel. What we learn in our childhoods sticks with us through life. The beautiful thing is, if you learn what your default is, you can recognize it in life and get out of your groove. But that default setting never really goes away. Sometimes when my hustle gets me no where — like I pitch 10 stories and get one rejection response and the other 9 are flat-out ignored — my go-to is to take it down. Why put 100 percent effort in when I can take it down to 60 percent and get the same 10 rejections, and still tell myself I tried? Sometimes it takes a lot of work for me to pull myself out of the not-for-me groove and keep my effort strong. I know it’s total BS. I know what looks like “success” to an outsider really isn’t for that person sitting at the top. I mean, I won’t name names or anything, but I see plenty of marriages that look great from a distance, but when I look a little closer, I think, “good God! That’s not good. I definitely don’t want that!” Or the successful career that means sacrificing fun time. I don’t want that either. I like knowing my evening and weekends are mine. All mine. So we all have our beliefs. Some believe their looks will take them everywhere, therefore they don’t go out without the perfect outfit and full eye makeup — even to go grocery shopping or the gym. Some try so hard to please everyone else, believing the reinforcement they get will carry them through life. I think I have plenty of company in the not-for-me club. Am I right? No judgements. We all are who we are, and that’s a beautiful thing, too.